Preble Shawnee’s Ty Stevenson pins Eaton’s Tyler Schmidt during a semifinal match on Saturday, Feb. 17, during the Southwestern Buckeye League wrestling tournament. Stevenson won the 220 pound weight class to help the Arrows to a runner-up finish in the Buckeye Division for a second straight year. Preble Shawnee’s Travis Howard scored a 13-0 decision over Franklin’s Logan Raney during the semifinals of the Southwestern Buckeye League wrestling tournament on Saturday, Feb. 17. Howard placed second at 145 pounds. 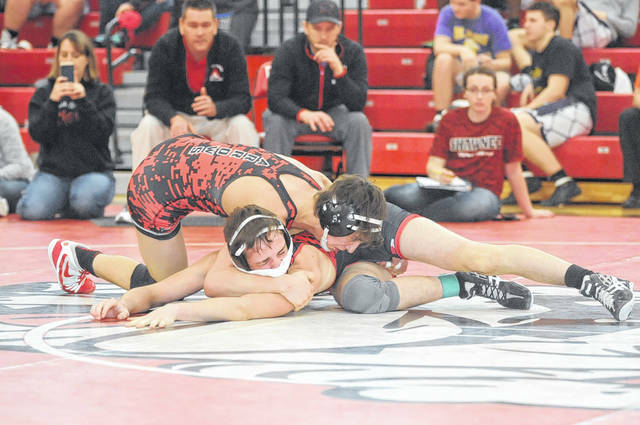 WEST MILTON — With a roster full of freshman and sophomores, Preble Shawnee’s wrestling team repeated as runner-up in the Southwestern Buckeye League Buckeye Division. The Arrows scored 106.5 points. Milton-Union won the Buckeye Division with 131.5 points on its home mats. The tournament was held Friday and Saturday, Feb. 16-17. Valley View was the overall champion with 219 points. Despite filling just over half the weight classes, Shawnee placed eighth overall, while Milton was fourth. Shawnee, which had six of its eight wrestlers place, had one champion and a runner-up. Sophomore Ty Stevenson, the No. 1 seed at 220 pounds, beat Carter Winch of Oakwood 17-2 in the championship bout. H won his first two matches by pin. At 145, freshman Travis Howard was the No. 2 seed and finished second. He lost by pin in the final to Dylan Schenck of Milton-Union in 2 minutes, 43 seconds. At 113, sophomore Rylan Roberts placed fourth. Freshman Triston Engle placed fifth at 152 pounds. At 160, sophomore Kanyon Schall took fifth. At 285, freshman Bryce Abner placed fifth. Shawnee will compete in the Division III sectional at Sidney Lehman Catholic High School on Friday, Feb. 23. The finals are set for Saturday, Feb. 24. The top four in each weight class will advance to the district tournament at Troy’s Hobart Arena on Friday and Saturday, March 2-3.
https://www.registerherald.com/wp-content/uploads/sites/41/2018/02/web1_ehs_ps_stevenson_schmidt.jpgPreble Shawnee’s Ty Stevenson pins Eaton’s Tyler Schmidt during a semifinal match on Saturday, Feb. 17, during the Southwestern Buckeye League wrestling tournament. Stevenson won the 220 pound weight class to help the Arrows to a runner-up finish in the Buckeye Division for a second straight year. 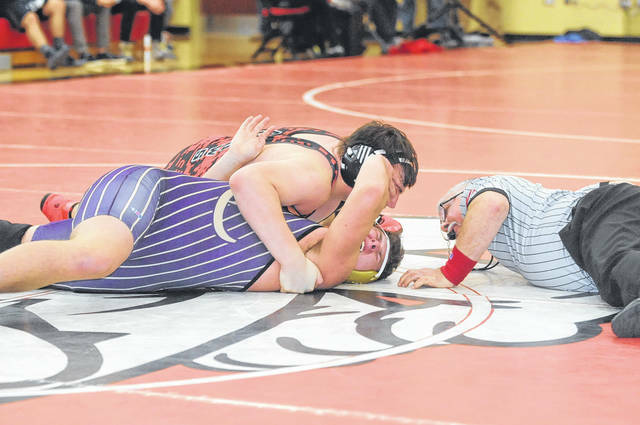 https://www.registerherald.com/wp-content/uploads/sites/41/2018/02/web1_pswr_howard.jpgPreble Shawnee’s Travis Howard scored a 13-0 decision over Franklin’s Logan Raney during the semifinals of the Southwestern Buckeye League wrestling tournament on Saturday, Feb. 17. Howard placed second at 145 pounds.